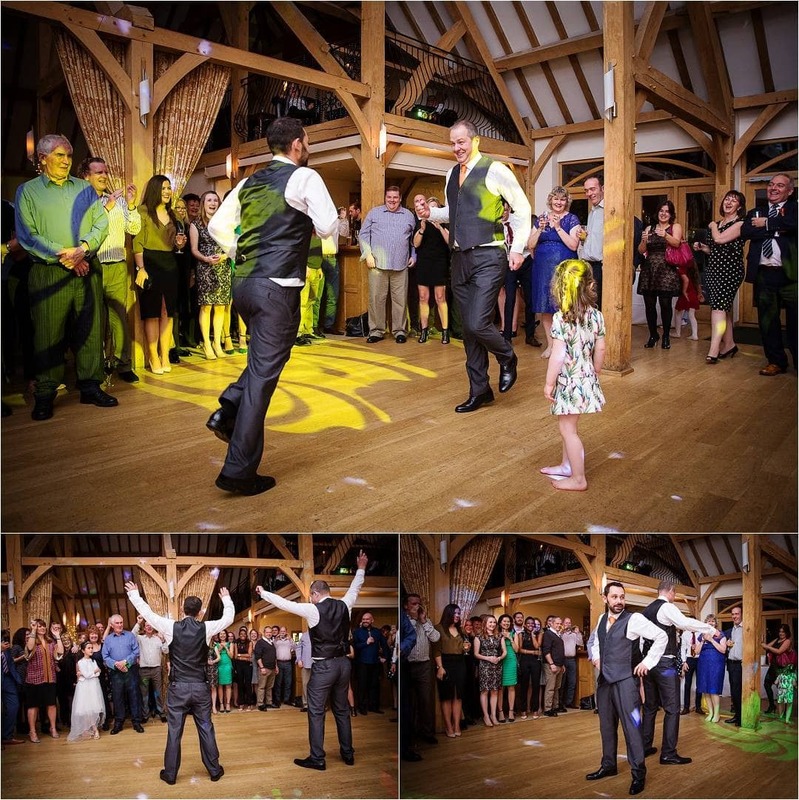 Rivervale Barn is set on the banks of the River Blackwater in Yateley, Hampshire. It was the perfect place for a luxury wedding photographer, like myself, to find great hidden spots and really show off the beauty of this location. This country barn is a fantastic wedding venue and with a few individual touches, your day can become extra special. Shaun and Jean-Pierre made a wonderful wedding couple and they chose to start their day in­ their own way. Taking more of an American approach, they had a first look moment in the grounds of Rivervale Barn. They decided to help each other get ready for their wedding and it was such a beautiful touch. It’s these little moments that set their wedding apart from a traditional wedding. Family and friends started to arrive to greet the excited couple. I then took the chance to whisk them away for ten minutes for a few photos before they exchanged vows. I asked the owners of Rivervale Barn to let us use their garden for these shots and I’m so glad that I did. With the fantastic scenery and the perfect poses that Shaun and Jean-Pierre gave me, we were finished really quickly. Then they could spend more time with their friends and family. The reflections of them in the water are some of my favourite photos from 2016 for my Hampshire wedding photographer portfolio. Heading back up to Rivervale Barn and these two were ready to become a married couple. It was such an amazing moment for not only them but all of their family and friends too. The lamps up the aisle was a simple touch that added to the bright colours of the room and the couple lead each other down the aisle, hand in hand. The bright orange of their ties was truly complimented by their brilliant flowers with delicate dashes of white. With a round of applause, the exchanging of rings, an intimate hug and a passionate kiss, these two fantastic men were join together in marriage. Their wonderful wedding at Rivervale Barn was shortly followed by copious amounts of bubbly and big group hugs for the family photos. As everyone made their way in for the wedding breakfast, a few more hugs were shared and I stole the happy couple again for few more photos with Rivervale Barn as the backdrop. They were both so warm and welcoming, that they made the whole day a real pleasure for me too. Inside, I took the opportunity, while everyone was enjoying their coffee, to get a photo of every happy couple at the wedding. Then Shaun and Jean-Pierre could look back for years to come and remember all the smiling faces on their special day. This beautifully, brilliant and welcoming couple is made for each other. Throughout the speeches, there was nothing but love for them and all of their guests. It was all so much fun and there were even a few tears of joy. The laughs and the tears are what make the speeches one of the best parts of the day. To bring the wedding to a fantastic close, not only was there a great deal of dancing but Shaun and Jean-Pierre has invited a drag queen to perform. I must admit that this was the first drag queen that I’ve had the pleasure to photograph at a wedding but it was really fun. Plus, the newly weds had planned a choreographed first dance that blew the socks off everyone in the barn.The whole wedding was fantastic for everyone and not just the married couple. It was a momentous moment that will be remembered by everyone there for years to come.